What I love about eclairs is that they're sweet, but not overwhelming. The pastry is light and the cream filling isn't too heavy. Unlike a rich chocolate cake, eclairs always feel light and not too sweet. 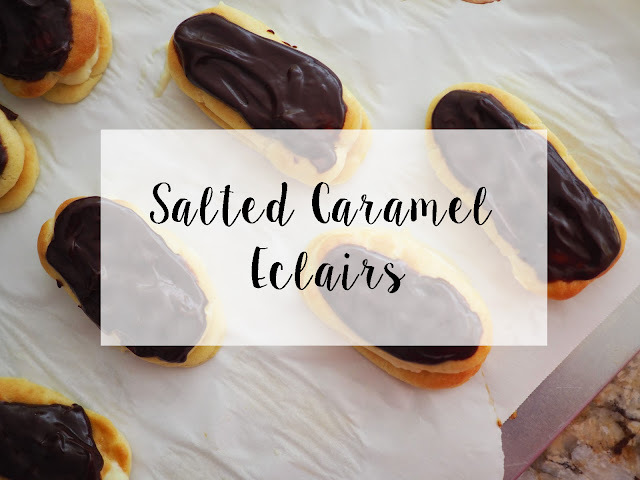 I encountered this fun combination of eclairs and salted caramel on Pinterest and found the blog, Fleur de Sel from it, which is where this recipe is from. This treat is actually pretty simple to make, except let me warn you that it requires more effort and time than some other things, because you have to make the pastry, the cream, and add the chocolate topping. If you're willing to put in the time and the effort, which I highly recommend, because these eclairs are definitely worth it, the recipe is right here. In a large saucepan, bring the water, butter, salt, and sugar to a boil over medium-high heat. When it boils, immediately take the pan off the heat. Add in the flour and stir with a wooden spoon until the flour is fully incorporated. Return to heat and cook, stirring, 30 seconds. Scrape the mixture into a mixer with the paddle attachment and mix at medium speed. While the mixer is running, add 3 eggs, one by one, and stop mixing after each addition to scrape down the sides of the bowl. Mix until the dough is smooth and glossy and thick to the point that it falls slowly and steadily from the beaters when you lift them out of the bowl. If the dough clings to the beaters, add the extra egg and mix until well incorporated. Fill a pastry bag with a 1/2 inch tip and pipe 3 inch U shaped lengths of dough, leaving 2 inches of space between them. In a bowl, whisk the egg and water together. Dip your fingers into the egg wash and gently smooth out bumps on the surface of the dough. Bake the eclairs for 15 minutes, and then reduce the heat to 375 degrees Fahrenheit and bake about 5 to 10 more minutes, or until the eclairs are puffed up and light golden brown. In a small saucepan, add some water and a bowl and use a double boiler method in order to melt the chocolate. Add the heavy whipping cream into the melted chocolate and whisk until smooth. Dip the tops of the eclairs in the chocolate glaze and then chill. Serve chilled. combine 1/2 c sugar and the water in a medium saucepan. Bring to a boil for 8 to 10 minutes, or until caramelized. The sugar should be fragrant and a deep amber color when it is caramelized. Remove the pan from the heat and dip the bottom into an ice water bath for a second or two. Increase the heat to medium and heat to a simmer. Meanwhile, whisk together the cornstarch and 1/4 c sugar. Add the eggs to the hot caramel mixture slowly. Whisk constantly over medium heat for 2 to 3 minutes, or until the mixture thickens and comes to a boil. Stir in the butter, vanilla, and salt. Refrigerate for about an hour before filling the eclairs.